Pope John Paul II – the second-longest serving Pope in history – remains a familiar figure even almost a decade after his death. How many, however, remember his immediate predecessor Pope John Paul I, who only served for a matter of weeks back in 1978? Born Albino Luciani, this pope was a humble, almost timid man, without any prior high-profile career in the Vatican hierarchy – a surprising choice in many ways. Catholics all over the world responded warmly to his modesty, however, and he soon acquired the nickname ‘The Smiling Pope’. At his coronation on 26 August 1978 he refused the customary papal tiara and only reluctantly agreed to be carried aloft on the traditional gestatorial chair. His reign was to last only 33 days, however; shortly after 5am on 28 September Pope John Paul I was found dead in the papal lodgings. The Vatican claimed initially that his body was found by his papal secretaries but afterwards it was revealed that he was discovered by a nun who had brought him his morning coffee. The papal doctor declared him dead of a heart attack and there was no autopsy. For any pope, let alone such a popular one, to die just a month after his election was unimaginable. Unsurprisingly, perhaps, conspiracy theories have abounded ever since. Rumours of foul play have circulated, implicating a bizarre triumvirate of Vatican conservatives, Mafia bankers and right-wing Italian Freemasons. What really happened to the Smiling Pope? It all goes back to the Second Vatican Council of 1962-65, which proclaimed a new, more open Catholic Church, and finally permitted a vernacular rather than a Latin liturgy. But the Church remained riven by factions. Some thought “Vatican II” had been dangerously liberal, others that it hadn’t gone far enough. Although birth control was outlawed, it was feared that the election of a liberal pope might change that and that John Paul I was that pope. Although publicly Luciani always supported the conservative line on birth control, some claimed that his speeches on the subject were subtly censored. On the other hand, Luciani’s allegedly liberal views on contraception may only have been a side issue. The real danger was his desire to clean up the Vatican Bank, an objective which brought the pope into conflict with both the Mafia and the secretive organisation known as Opus Dei (of Dan Brown’s The Da Vinci Code fame). Both, it is alleged, may have been laundering funds through the Vatican Bank, with or without the knowledge of the papal authorities. Needless to say, neither took kindly to the prospect of John Paul I interfering with their plans. Blowing the whistle on the Vatican Bank, however, was the least of Luciani’s alleged threats. Millions of people in Italy – almost a third, some polls suggest – believe that the former pope was also poised to expose the existence of a powerful Masonic cabal within the Vatican. Among the Masons, it is claimed, were none other than the Vatican secretary of state, a cardinal and an archbishop. All are supposed to have belonged to the lodge Propaganda Due, better known as P2, which was half quasi-Masonic network and half murderous terrorist cell dedicated to the establishment of a fascist state. This particular allegation comes from self-confessed repentant P2 member and tabloid journalist Mino Pecorelli. Even though he was the sole witness to come forward at the time, it is thought that what gives his claims particular credibility is the fact that he was killed in March 1979 – the first of a number of implicated figures and investigators who were murdered that summer. Even more bizarrely, Vatican officials asked English journalist John Cornwell to conduct a thorough, independent investigation and write it up in popular form. Written like a thriller, A Thief in the Night appeared in 1989. Cornwell’s book claims, convincingly, that the Smiling Pope had merely died of a pulmonary embolism. 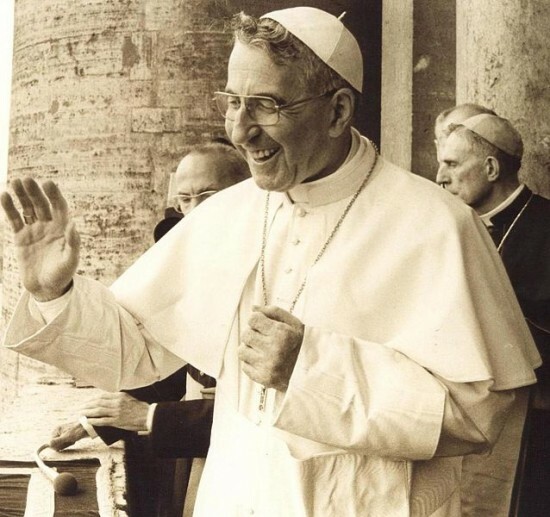 The death of Pope John Paul I continues to have political reverberations within the Catholic Church. There are the arch-traditional ‘sedevacantists’, who believe that all popes since Vatican II have been false popes. As early as 28 August 1978, maverick French sedevacantist Marcel Lefebvre claimed that the papal conclave had elected its candidate with suspicious haste, given that the necessary two-thirds majority had been achieved at only the third ballot. Some even claim that Pope John Paul I was an impostor. As for Luciani’s successor, Pope John Paul II, he was at various times dubbed a communist sympathizer on the one hand, and a tool of liberal capitalism – personally responsible for the collapse of the Eastern Bloc – on the other. In the end, it all seems to be a question of political sensibility: the Left is sure that the CIA was behind Luciani’s death, while the Right is convinced that the KGB were involved. Who knows who or what was behind the death of The Smiling Pope: a Masonic conspiracy, a Vatican plot or a pulmonary embolism? Your guess is as good as mine!